You probably know Plantronics as that company that makes decent Bluetooth headsets. What you probably don't know--but really should--is that Plantronics also builds decent audio gear for game consoles. Today at Gamescom the company announced yet another new headset, one meant to satisfy your needs for both business and pleasure in a single product. It's called the Rig, a headset meant to let you toggle back and forth between your game and your phone with the flip of a switch. Here's how it works: the back of the Rig's mixer sports a pair of two-way audio cables, and the idea is to plug one into your gaming machine's audio jack and the other into your phone. That gaming machine could be a PC, a Mac, a tablet, an Xbox 360 or a PS3--the Rig works with all of them, and it should also work with the upcoming PlayStation 4 and Xbox One consoles (though you may need to purchase an adapter if you want to use voice chat.) You could also conceivably jack the second cable into your tablet, your iPod, your laptop--pretty much anything with an audio out. You could use it to listen to your own music or watch a movie on your phone while chatting with your teammates, for example, and nobody should be the wiser. You flip back and forth between one channel and the other by punching a big switch in the center of the mixer, which looks sort of like a plastic hockey puck. You rotate the outside ring of the puck to control the overall volume of the headset and then adjust the proportional volume of each channel independently using the two plastic sliderse on the inside of the puck's outer ring. There's also a phone toggle that you can punch to answer or hang up on calls, a mic mute switch and an equalizer button that flips the headset between three vaguely-named EQ profiles: Seismic, Intensify and Pure. You can also remove the boom mic and attach a slightly stealthier cable with an in-line mic, allowing you to wear these things out in public without looking too ridiculous. 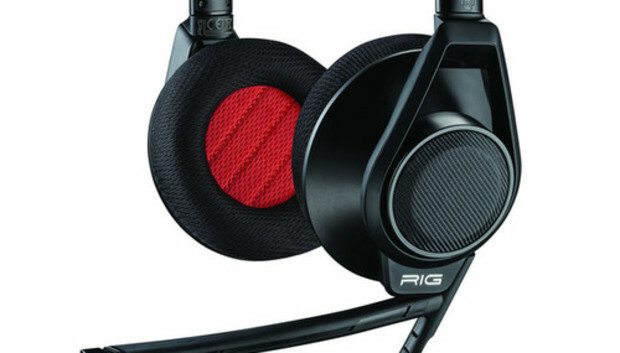 The Rig is available now for $130, and we'll have a full review of the headset in the days to come.